Today was a long one. Our goal was to reach Upper Travers Hut in order to be in position to clear Travers Saddle first thing in the morning. It’s a near-1800 meter saddle that we are only comfortable clearing in decent weather. Metservice predicts the next couple days to be quite dicey, with a small window of potential clarity first thing tomorrow morning. Our success in reaching Upper Travers today means we’ll be able to take advantage of that good/okay weather and make it to Blue Lake Hut tomorrow where we plan to wait out Sunday’s predicted storm, with the hope of clearing Waiau Pass on Monday, which Metservice says will be slightly better weather. Today was absolutely stunning. 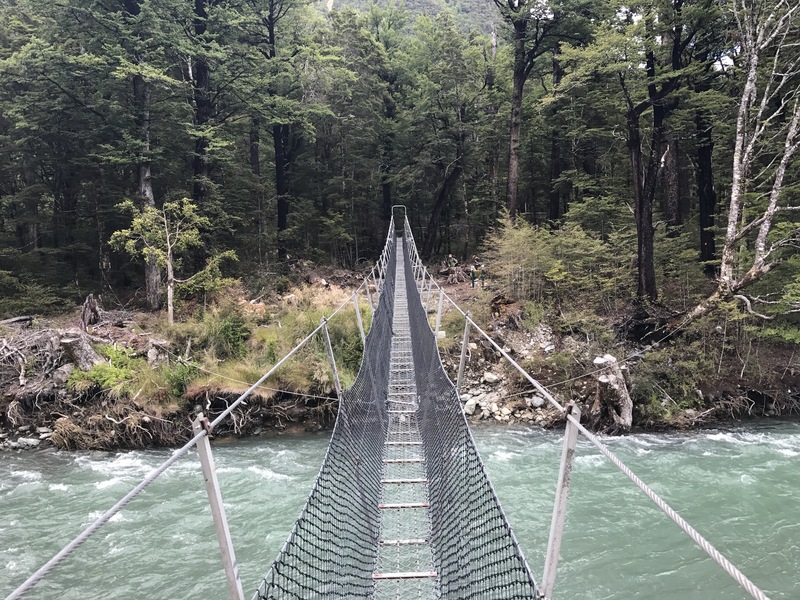 Our day began in the alpine village of St Arnaud, where we hopped on an easy forested track which brought us to the north shore of Lake Roititi. The beautiful snowcapped peaks in the background got us very excited to get up into the range, but also kept us aware that the range’s weather can be tricky. We spent our whole morning walking the length of the emerald lake, hopping around streams in flood since two days ago’s torrential downpours. Our first stop of the day was Lakehead Hut, where we jotted our names and plan in the Hut Book and checked for familiar names ahead of us. After Lakehead hut, the track crosses a branch of the river in the wide valley. The maps make it look like the trail base of the mountains on the east, but that isn’t right, the trail cuts right up the valley in beautiful flat (but very wet) walking. The swollen Travers River was amazing to watch, picking up intense water from it’s many glacial tributaries. We broke for lunch after a swing bridge at around kilometer 1960. The blackflies hurried us off after lunch, a welcome rush given the distance we had left to cover. 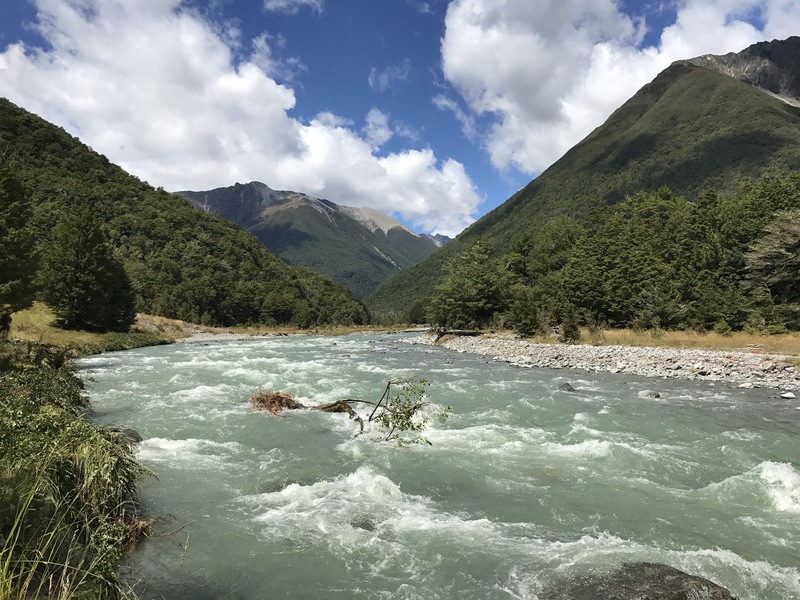 We spent the rest of the afternoon walking beside the Travers River, watching it crash down in colossal blue rapids brimming with debris shaken loose by the flooding. Small bridges over rumbling side streams let us peek into some beautiful mountain gorges, equally full of the impatient water. Flooded side-streams made it impossible to keep our feet dry in this section. Seems mentally easier and also safer to just commit to the wet feet. At around 3:00 we passed John Tait Hut, where we stopped in to add ourselves to the hut book and take a quick break. We were determined not to take the trail notes’ full 3 hour time estimate from John Tait to Upper Travers. We got going quickly and began to feel a bit of rain. We slipped on pack covers and pushed on. 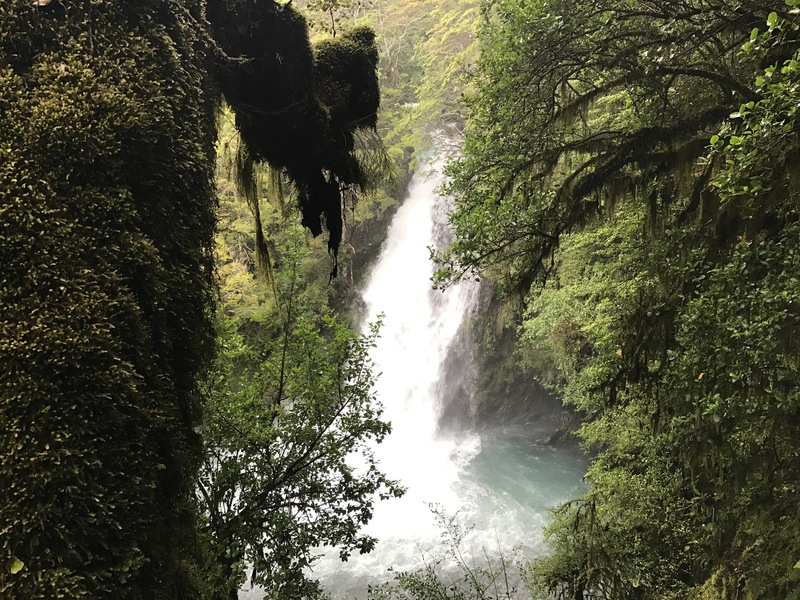 In the rain, we hopped down the side track to check out the mighty Travers Falls, a 15 meter waterfall that is extra forceful due to the flooding. Definitely a highlight or the day. Soon after the falls, it began to clear up and about 4 km short of upper travers, things really got gorgeous. Earlier in the day we had caught our first glimpse of the snow-capped Mt Travers. Now, we were surrounded by snow brushed peaks and the sun was beaming down. The blue river was lit up by the fresh shot of sunlight, and we kept walking with new energy. The forested climbing got more redundant as we got more tired. We pushed on with a serious case of hut fever. 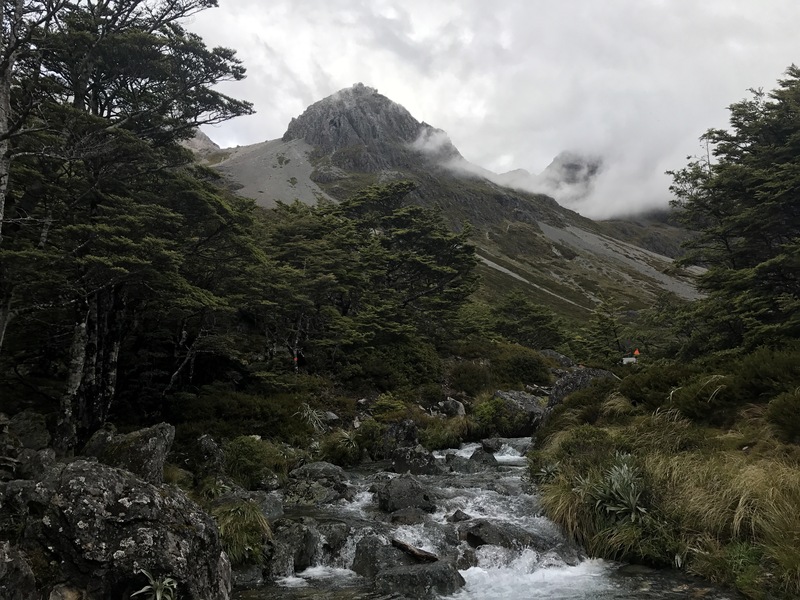 Soon enough, after plenty more stream crossings and avalanche path rock-hopping, we broke through the dense forest and saw Upper Travers hut. The hut is framed by a perfect semi-circle of towering peaks, including that of Mt Travers. 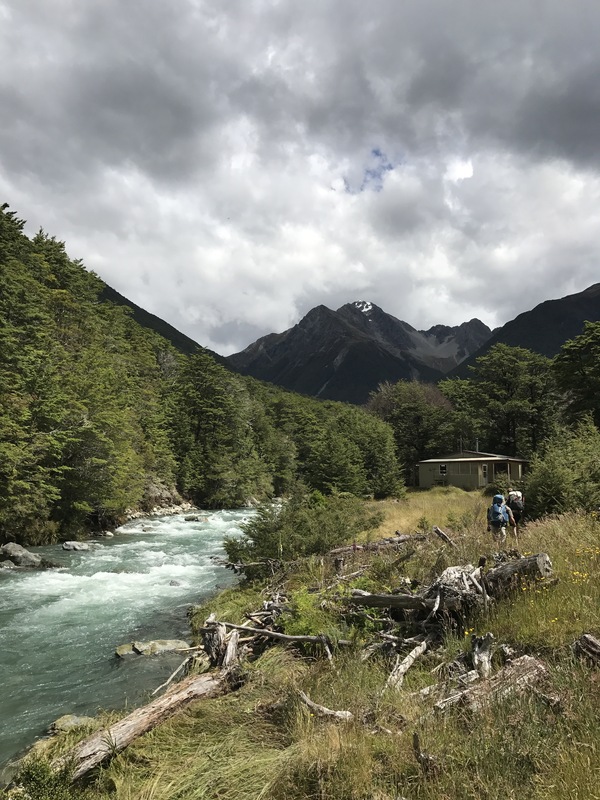 The river rushes right down the middle of the mountain scene, creating a perfect setting for experiencing the relief of reaching the hut after a tough day. We arrived in the hut to meet a number of TA walkers including Lukas (met after Queen Charlotte) and Kate. We made cous cous with cheese sauce and played Hearts until our mental and physical soreness got the best of us. Here we we are, in a gorgeous hut, cradled at the base of some gorgeous mountains, on day 82 of a gorgeous trail. Looking forward to tomorrow. Wow! The difference in the Travers River after the rain is amazing. 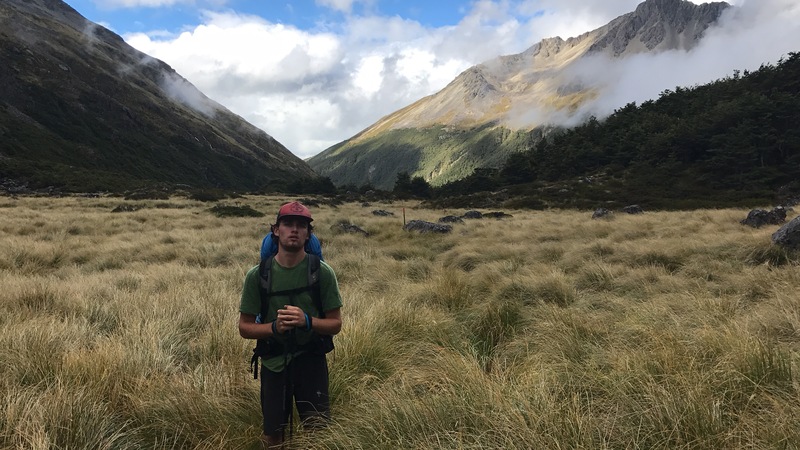 I walked from St. Arnaud to Lakehead Hut (and a little beyond) when I was there. The river looked nothing like that! I guess that’s what all these “don’t cross the rivers after rains” means! 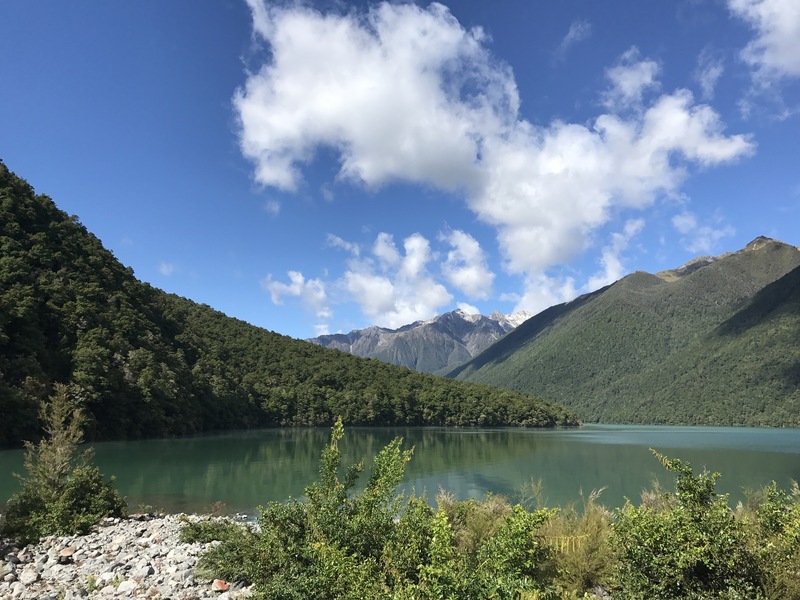 Previous Previous post: Day 81 – St. Arnaud Zero Day!